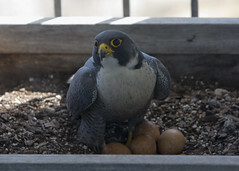 Matt and I went up to Wrigleyville to meet with a woman lucky enough to have peregrines nesting in the planter box on her balcony. Talk about front row seats! Both of the adults are unbanded. The male is very, very tiny, but pretty. They currently have four eggs and all seems healthy and going as planned. They are about two weeks behind everyone else, so their eggs should be hatching sometime this week. I have to say that the peregrines have great taste. The view over the wide expanse of Lake Michigan was breathtaking. I wonder what it would be like to watch a summer storm from that vantage point. Talk about spectacular. ~ by Steph on May 16, 2013.